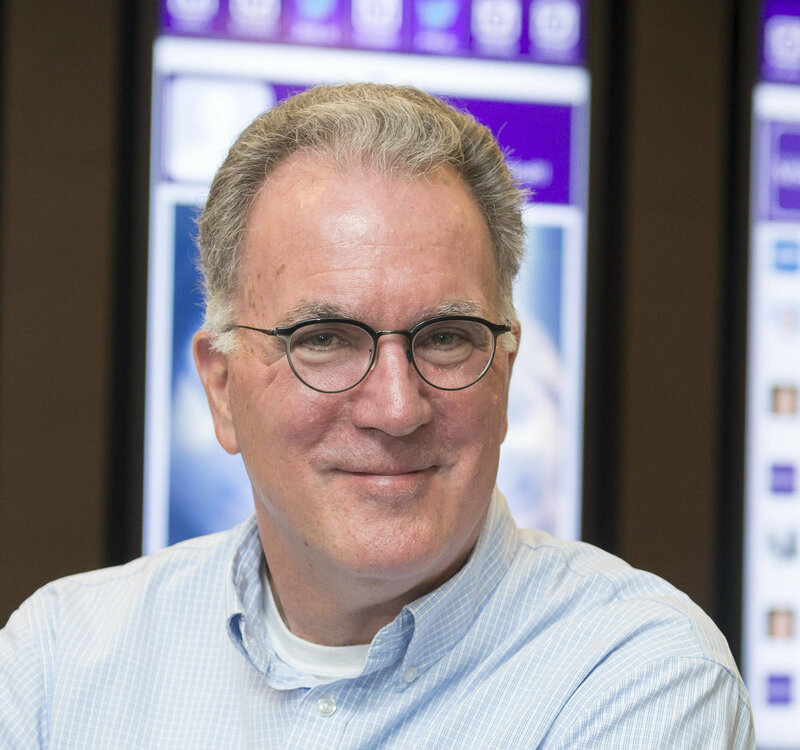 In the latest interview for the Liminal Leaders series, I was lucky enough to be introduced to Jeff Merrell who made time to talk to me about organizational change, the impact of galloping tech development and his work at Northwestern University. Jeff describes his professional role as exploring how social collaboration technology might change the experience of learning and teaching in workplaces and higher education. He is Associate Director of the Master's Program in Learning & Organizational Change at Northwestern University (MSLOC) where he teaches MSLOC 430 Creating and Sharing Knowledge. Jeff's role as Associate Director also includes leading the educational technology strategy for MSLOC and the program's innovative use of social collaboration and social media technologies. Prior to joining Northwestern in 2008, Jeff’s professional background included experience as both a consultant and corporate leader in learning and development. Jeff has an MBA from Northwestern’s Kellogg Graduate School of Management and a Master of Science in Learning and Organizational Change from Northwestern’s School of Education and Social Policy. Hi Jeff, Thanks for making time to talk to me today, can I ask you first if you see major change as being something which is going to be inevitable in most organizations the world over, both commercial and non-commercial? Yeah, I think major change is happening, and I would expect that to continue. Maybe I have a bias there because I live in the world of people who think about organizational change, but my evidence is just how much talk there is everywhere about change. Whether there is a specific organizational change that is actively underway or not, there is at least the recognition that something needs to change and people are trying to figure out new ways of doing things. That seems to be much more up front for me than say, in the organizations I was working in 20, 25 years ago. Yeah. I was reading a study that was done by IBM in 2009, so now eight years ago. They interviewed over 1500 CEOs on the subject of coping with increasing complexity. The number one quality they identified as essential in future leaders, is creativity. Yeah, the creativity or innovation piece is interesting, but I see it connected also to dealing with ambiguity. For close to 10 years now, I've been in this role at Northwestern in the Master's Program in Learning and Organizational change, so my exposure to these topics is primarily through the student body that we bring in. The way we teach is that there's more of an exploration conversation with our students, as opposed to here are nine things you need to know. There's some of that, the fundamental stuff, but at the end of the day, all of these topics we're talking about in each class, there's just no single right answer. The creativity element is there, the innovation element is there but one of the bigger things that comes out in all of this in terms of people's abilities is their ability to deal with ambiguity. I see some innovation and creativity tools coming out of confronting the question: How do we deal with systems that are complex? So not chaotic, but complex, where things may be rapidly changing, and possibly bounce into chaos at times. We have to be able to admit that if we think that we can predict the future, we can't, so how do you lead through that? There's a comfort level there of being able to have a tool set and a set of sensibilities, that helps you deal with ambiguity. That seems to be more of a central theme that comes across in all of the work that we do. Right, that must be very interesting. Fascinating to engage with a lot of young minds who are right there, thinking about their future and seeing that is is undeniably pretty complex. Honestly, it's the best gig I've had. I mean, I'm reading some of the interviews that you've done. What I do - it's a slightly different version of the same thing, getting a chance to talk to people that are interesting and working through stuff and exploring a topic. One of the things that has emerged in several interviews has been the sense that people have to be prepared to go through the , sometimes disturbing, experience of stepping outside of their own bubble, outside of their own comfort zone in order to really question whether the fundamental beliefs they have are actually right or not. That is another theme that we've been conscious of embedding in the curriculum; self-awareness. There is anecdotal but compelling evidence from stories and experiences that we have that self-awareness coupled with the ability to accept ambiguity is a powerful combination. Being able to look at a complex situation and understand that there are unknowns and ambiguity there, and being self-aware of who you are, where you're at and how you're dealing with that, seems to work well. You see the system and yourself in the system. I was having lunch yesterday with one of our students who's just about finishing up. A graduate assistant. She was talking about her own transformation over the last couple of years, recognizing that she was very performance oriented. We make students aware that if that's your shtick, then you're going find yourself in situations where that shtick doesn't work really well all the time. She was talking about how she just got more comfortable with moving out of that zone. She learned how to recognize where she's playing to her strengths, and where she needs to stretch a little bit, and how that helps her, as a leader, deal with situations that are fuzzier than what she's dealt with in the past. That’s important, isn’t it? you're not the first person who's mentioned the sense of their being a reciprocity between self-awareness, self-development, and the welfare of the organization and its ability to change and respond. I don't come from an academic research background, I come from an organizational background. I'm now in a situation where we have access to some interesting research work and people who do some things that we talk about and that’s great. But another area of interest is when you look at some of the stuff that's coming out of design thinking. What's most intriguing about that is the awareness of the ‘other’. The empathy sought for, through customer journey mapping, this whole thing about employees really trying to understand the thinking and feeling of customers. It's about others interests, not their own. I'm intrigued by how you become good at that, and the connection between that and your own self-awareness. If I'm a fairly self-aware person, and I put myself in a situation where now I'm really trying to understand and be empathetic with others, how does that connection get made? Because that's a huge trend I'm beginning to see, the take-up of a number of tools and methodologies that really emphasize empathy and developing the experience of the people in the organization so that they acquire a skill set and a mindset, that makes that work well. That brings me to my next question actually. What part do you think that leaders changing their own way of looking at things, truly questioning their belief systems might play in employees developing that skill set. I'll just talk about my own experience in working in our department and what we do with our program. I'm surrounded by people who think about these kinds of things, so it's like you're constantly questioning what it is we might be hanging on to and if that’s helpful. We're a relatively small program in the School of Education and Social Policy but we've had some success and I think a lot of that has to do with exactly those things. All of us being pretty aware of our own identities and what we bring to the table, and then trying to continually question our own thinking and approach and being empathetic to our customers, the students. One way of looking at it is, who are those people that could benefit from this type of educational experience? How is that changing, what do we need to do to continue to provide value for the different folks that apply and join our program? That must be a real challenge, actually, I think, because one of the things which has come up a couple of times in the interviews I've done has been the future of work, and how are people going to get jobs, and what are they going to look like in another five or 10 years? So staying in touch with all of that and delivering the courses must be a pretty good balancing act. Yeah, we have a lot of people who are in the larger talent management world that come to us because that’s what they do professionally. In the new environment in larger organizations, the shift to essentially contract work creates new challenges. For example the basic questions of team formation and how you build structures, how you build capacity. So you may be forming teams to do things that are part traditional employee, part contract employee, and part who knows what. It's very different to 25 years ago when everybody in a team were coming from a common employment relationship with the organization. Yeah, several people have mentioned to me that they think one big shift is actually away from a focus on people as part of a production process because more and more, anything which can be algorithmized is being mechanized. The value-adding things that people can do have fundamentally changed from the original Taylorist model of scientific management, especially in the past 10 or 15 years. Well there's definitely some of that, but I'm still checking my thinking on how much of that is actually happening. Literally yesterday, I was having a conversation with one of my colleagues who knows a company that has built itself by acquiring other companies. They're fairly large in terms of the number of employees and stuff. They literally say, “we have a factory model of work”. This is a software company and that’s still how they think about their employees and their work. It blew me away, in one way and I was just shaking my head a little bit. So, I'm not sure how deep that change is or how fast it is really happening. My background, and area of professional interest is in the role of technology and I'm particularly enamored by the types of technologies that support collaboration and learning and knowledge sharing. If you’ve lived through the introduction and impact of new technologies for quite some time (as I have) then you tend to feel that neither the dystopian view or the utopian view of technology, which are both a kind of techno-determinism, is what actually happens. At the age I'm at, I have seen the impact of different major technology changes on organizations, and what things really did have an impact, and how it actually played out over time. That leaves me tending towards a viewpoint where I think “it's really cool stuff, sure, but maybe history needs to play out a bit here before we decide exactly how it really looks.” I was around before email, before PCs and having watched the whole web thing come up, then social technologies and now AI, voice-enabled stuff and mobile. I think, with that longer view, you begin to get an appreciation for where things really do have an impact, and where they're still sorting themselves out. Within that context, not necessarily exclusively in terms of the application of technology, but in terms of organizational change which may be impacted a lot by technology, what role do you think things like values and purpose play for organizations? Let me say, I've heard those terms used an awful lot. Some of the things that I've seen under that banner are not particularly productive, I think, but I'm interested in your view of how that can work. I do think those things are hugely important, and will continue to be in a couple of ways. So students, they're emerging leaders, right? They're people in their late 20s, early 30s, who are going to be future leaders of organizations. They are privileged enough to be able to come to a place like Northwestern, and I'll tell you, they're very explicitly aware of the value and purpose choices that they make when they begin looking at career opportunities. There could be an element of self-selection in that we tend to draw people like that. But for example, I was talking with someone who is working in the industry that does credit reporting. He's working as an intern, and he said the work itself is really fascinating. Yet he's also going “Oh my God, now I understand what this industry does and why they're doing it and I think I could play my career card elsewhere.” This is a very talented person making that kind of statement, to me, based on his perception of alignment between his own and a future employer’s purpose and values. That must be quite exciting to actually see that and to be a part of it. When they move on, do you get students coming back and feeding back to you on the stuff that has happened to them since? Yeah, exactly. That's a big piece of our read on what's happening in the area. On the values thing, I teach in the winter quarter, and this'll be the first opportunity that we will have to explore the Google manifesto blowup. To me, this a mash-up of technology that makes people's sharing and thinking visible, the purpose of the organization, espoused values, real values… it all comes crashing together. It has consequences. I do think those things are important and you have to recognize those moments when they really jump out at you. That sounds like it is going to be really interesting. To have a whole bunch of bright minds, lively thinkers actually focusing on looking at that and looking at all the questions and issues which are involved in it. I have a follow-on question; you must have a really busy life. What does a day in your life look like? Well, it starts with coffee. You know, right now I'm super fortunate. I live a mile and change from the campus, so I get to walk to work or bike when the weather's nice. Northwestern’s campus is on the edge of Lake Michigan, so it's a beautiful spot. A Typical day for me starts by just having some time by myself. It's a different kind of commuting by this beautiful urban lake campus. Frankly, it’s the best commute I've had in my life. My main role is administrative - helping run the program. My day is taken up with thinking and working a lot on all the elements of the program, finding students, recruiting students, curriculum, faculty recruitment, our staff organization, budget, all that stuff. The fun bits are related to the experience of the curriculum. We have a pretty tight team where we spend an awful lot of time talking about what it is that we need to be exploring in the curriculum, and how do we do that, what experience are we going to create through our faculty? Can I ask you, If there's one thing which stands out in your mind as being something which you would say to your students or to the people in the organization about making things work, about doing change, what would that be? You know, I'm stealing from my director, Kimberly Scott, who a couple of years ago talked about this idea of the importance of having both tools and sensibilities. We get wrapped up an awful lot in tools, for example, design thinking and the idea that if you just use human centred design and follow the process, everything's going to be great. But if you don't understand people's emotions as part of that, or the way that they think, you're really going to be missing something. There's something about that, I think for any leader or anybody who's in any kind of leadership position, this whole thing about appreciating tools as tools and having a lot of them available to you, but also having a strong sense of people. No particular tool or system or structure is going to do it for you, so you don't have to worry about anything. Do you mean something like the saying, “the map is not the territory”? Yeah, that's exactly it, bingo! Balancing tools and technologies with human sensibility and self-awareness? That seems like a pretty good place to park for now. Thanks Jeff for taking the time to talk to us today. It will be great to see how what you're doing with Northwestern continues to develop. You can find details of the Northwestern MSLOC program here , you can access Jeff’s blog here and follow him on twitter @jeffmerrell.